Western Ag Enterprises, Inc. annually converts 60 million square feet of material for the agricultural, industrial, mining, transportation, and recreation industries. We bring years of design experience to suit the specialized needs of our clients. Western Ag's facilities are designed to handle large and volume projects. 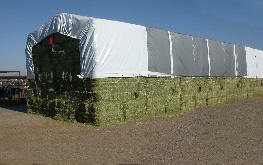 We also have installation crews available to service hay tarps, silage pit covers, and liners in many areas. Main corporate office and manufacturing facility is located in Phoenix, AZ.